It seems that no matter how much storage an iPhone or an iPad offers, you still end up wanting more than you purchased. Although there are myriad Cloud solutions for backups and more storage space, a more affordable and portable option is now available. PhotoFast CR-8800 iOS Card Reader for the iPod (6th generation), iPhone( 5-6S Plus), and iPad ( Air, Air 2, Mini, Pro) allows you to to have up to 128g extra storage space for your device. The PhotoFast CR-8800 as reviewed does not come with a microSD card but many microSD cards will work with this device. PhotoFast sells their own microSD card that states it has a low power mode for low power consumption. For this review, I used a 64GB Samsung microSD card. To prepare to use the PhotoFast iOS card reader, you must first download their PhotoFast app on the AppStore. They have two apps; the one that works with the CR-8800 is the PhotoFast i-FlashDrive ONE, not the HD version. Once the app is installed, just place the PhotoFast CR-8800 card reader into the lightening port in your device and instantly the app opens and an array of options are available. You can link your Dropbox, Google Drive, YouTube, and Vimeo accounts, and access your music, videos, and photos on your device and move them to the microSD drive. The app also allows you to backup your Instagram, Contacts, Tumblr, Facebook Album, Dropbox, Google Drive, Photos, and also to backup content on your device. I have over 24,000 photos on my iPhone, which unfortunately is due in part to Apple’s iCloud replicating photos in my camera roll. PhotoFast states the iOS card reader can transfer and store up to 32,000 photos. The app only performed a backup of 6,527 photos on a 64g microSD card. My battery was 99% at the start of the backup and finished at 81%. I’m puzzled why an entire backup did not happen and I attempted to perform a photo backup twice again with the exact same result. It will not backup my entire photo roll on my iPhone 6S. I was disappointed not to be able to back up my photo roll especially as the microSD card has 55.5GB of additional space left. I was pleased to see that the app does recognize duplicate photos and skips them. The PhotoFast app also has a video option that you can view videos from your camera roll and download them onto the card reader. I selected a video to download onto the card reader and the app froze, I had to get out of the app and try again without success. PhotoFast states you can store up to 12,000 songs. The app accesses your iTunes music as well as your downloaded podcasts on your device and you can play the music back as well as AirPlay. The iTunes music that I have purchased allowed me to listen to the songs via the app but not download them to the card reader. I could not find any option for this and the app crashed several times trying to select music so I ceased trying to move or backup any purchased music from my library. You can download music from your computer to the card and stream it via the PhotoFast card reader. I was able to copy Dropbox files and Google Drive files to the card reader without any issues. The app accesses your YouTube account and you can stream videos and upload videos from the PhotoFast to your account. 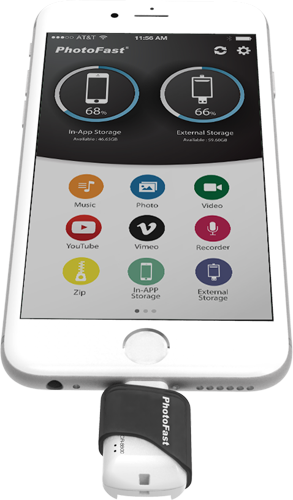 Additionally, the app allows you to zip and unzip files, perform a voice recording, and the aforementioned backups. The PhotoFast is lightweight at 0.5g, and is very small (33.1 x18 x 9.1mm) so it would be a good idea to use the small opening at the top of the device to insert a tiny lanyard or strap so it doesn’t become lost. I would have liked PhotoFast to include a small strap for that issue. 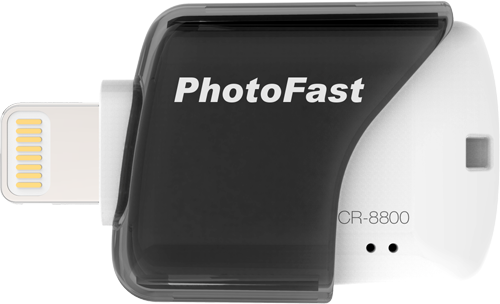 PhotoFast CR-8800 iOS Card Reader has some good storage options but I found it limited. I would rather have fewer options like accessing and watching videos via YouTube or Vimeo, and instead have the app and card reader perform an entire photo roll and video backup. The card reader itself is a great storage option to have on hand but the PhotoFast i-Flash Drive ONE app needs a stability fix to prevent battery drain, freezing, and crashing. Once these issues have been addressed then I would recommend the PhotoFast CR-8800 iOS Card Reader for anyone who is running of of space on their Apple devices or who feel a bit more secure having an extra backup of their content on a secure card.